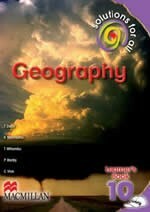 The Solutions for all Geography Grade 10 Learner’s Book has been developed to support the content (knowledge, concepts and skills) contained in the National Curriculum Statement (NCS), as organised in the new Curriculum and Assessment Policy Statement (CAPS) for Geography. The Solutions for all Geography Grade 10 Learner’s Book has been organised to support teaching and learning in the Geography classroom by presenting the material to be taught and practised in the classroom in 30–60 minute lessons. In each lesson the learners will:• Establish what they already know about a topic• Learn new facts about a topic• Practise using the new knowledge, concepts and skills they have acquired in the lesson. In addition, learners are provided with:• Additional homework activities• Extra practice activities that cater for both remediation and enrichment• A summary of a cycle of work. The Solutions for all Geography Grade 10 Learner’s Book is supported by the Solutions for all Geography Grade 10 Teacher’s Guide. This course provides everything the teacher and learners need to master Geography in Grade 10: a complete solution for the classroom.